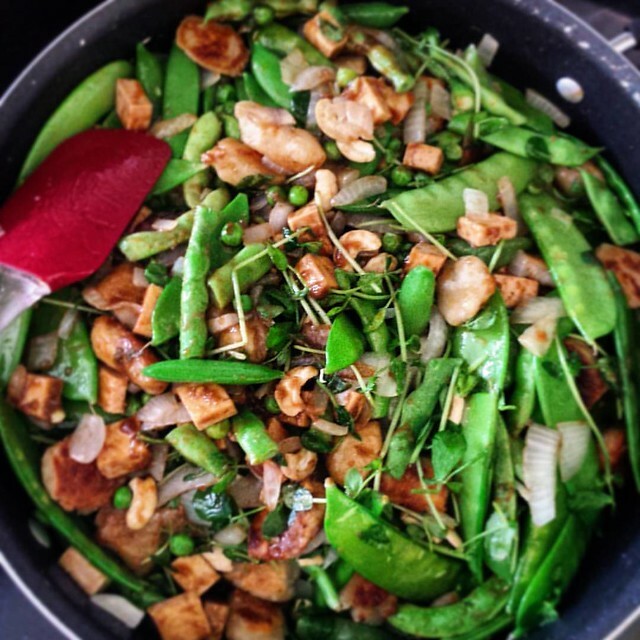 Quadruple Pea Stir Fry | What Smells So Good? Even though winter has barely arrived on the calendar, it feels like it has been far too long since the greenness and life of living plants outdoors have been visible. The farmer's markets have been dormant for months now, and likewise the grocery store has been nothing but a black hole when it comes to sourcing any sort of fresh produce. When we can find fruit and vegetables out of cans and freezer bags, they're of dubious quality - not to mention they're prohibitively expensive, especially when we're cooking for a minimum of two produce addicts! It's not like this is a brand new phenomenon here - for as long as I've been alive and longer, most Canadian winters are the deathly cold, windy and snowy variety. However, it's only been the past 10 or so years, when I've been buying groceries, that I've truly realized how bloody expensive anything fresh and vibrant is when we aren't in the 2-week-long growing season. 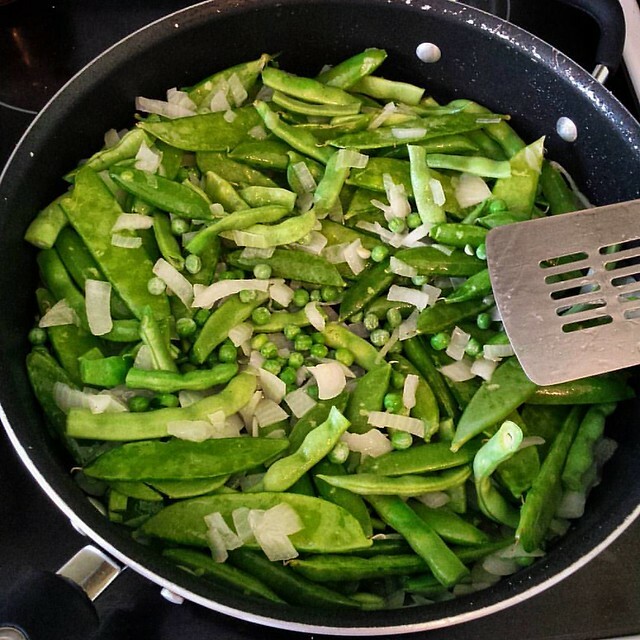 With our garden proliferating over the summer, my Mom and I have become more or less proficient at blanching and freezing the hardier items like peas and beans. We also started cooking and freezing our homegrown soup beans for cheap and healthy dinners on the fly, and while I keep struggling with my indoor garden of herbs and microgreens, the ones that make it to harvest are delicious! With a few bags of greenery sitting in the freezer and a yen for something more "springlike" than ice pellets and snowflakes, I decided to try re-making a dish I concocted over the summer - a somewhat unorthodox mixture of Asian and Italian cultures in a slightly spicy meal-in-a-bowl. The gnocchi (again, homemade from the freezer) mimics Korean-style tteok ppoki (rice cakes), Helping to soak up the delicious hoisin-ginger-garlic sauce along with the extra firm tofu and green veggie medley. 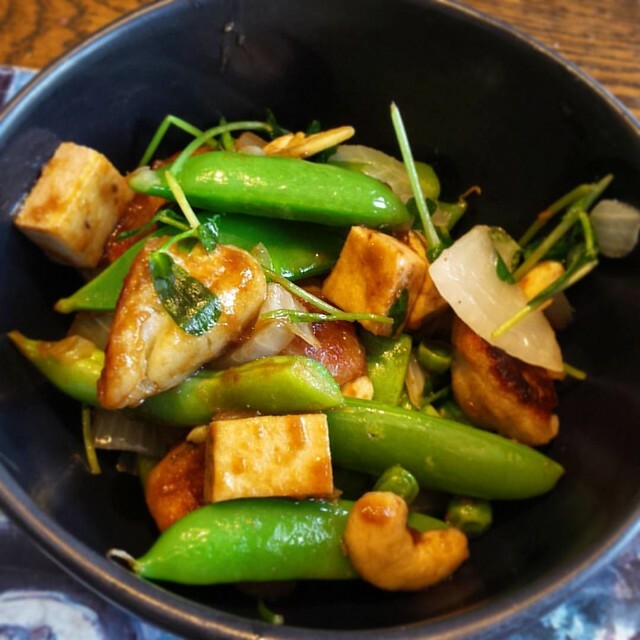 In total, four varieties of the sweet, springy green vegetable make their way into the stir fry - the only one that you'd have to procure fresh is the pea shoots (but you can substitute parsley, watercress, even a small amount of spinach if you want). Whisk hoisin sauce, soy sauce, garlic, ginger and Sriracha in a medium bowl. Heat a large, dry nonstick skillet over medium-high heat and add the tofu. Cook, turning to brown all sides and pressing as much extra liquid out of the tofu as possible. Transfer to the bowl with the sauce and turn to coat. Set aside. Add the sesame oil to the skillet and add the gnocchi. Sauté about 5 minutes, stirring frequently, until warmed through, light brown and crispy. Move to a plate and set aside. Add the canola oil to the pan and add the onion. Cook, stirring often, until translucent. Add back the tofu in the sauce, the gnocchi, the pea shoots and cashews. Cook, stirring, until heated through, about 1 minute.